If we must die—let it not be like hogs… Hunted and penned in an inglorious spot/ While round us bark the mad and hungry dogs/ Making their mock at our accursed lot. If we must die—oh, let us nobly die/ So that our precious blood may not be shed in vain; then even the monsters we defy/ Shall be constrained to honor us though dead! Oh, Kinsmen! We must meet the common foe/ Though far outnumbered, let us show us brave/ And for their thousand blows deal one deathblow! What though before us lies the open grave? Like men we’ll face the murderous, cowardly pack/ Pressed to the wall, dying, but fighting back! 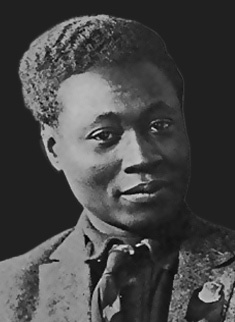 * Claude McKay was born in Jamaica, on September 15, 1889. He was a pivotal voice in the Harlem Renaissance.